This month, Los Cabos is hosting exciting events including the Mexican Tennis Open, artistic dance shows, races for a cause, culinary encounters and thrilling tournaments. Find out what’s happening and book your dates to enjoy some of these grand experiences. 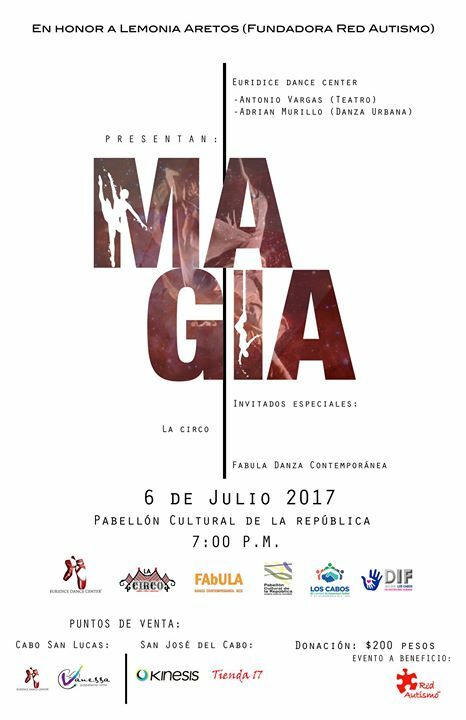 “Magia” is a show featuring dance, theater and more, inspired by Lemonia Aretos, founder of Red Autismo. The event takes place at 7:00 p.m. at the Euridice Dance Center, Blvd. Paseo de la Marina, Lote 8, Centro, 23450 in Cabo San Lucas. In collaboration with Antonio Vargas, Adrián Murillo and special guests from LaCirco and Fábula Danza Contemporánea, the Dance Center is putting on a show you can’t afford to miss. Funds benefit the Red Autismo A.C. Tickets are $200 pesos and can be purchased at the Euridice Dance Center, Papelería Y Arte Vanessa, Kinesis Gym and Tienda 17. This is the largest fishing tournament in Baja California Sur, with over 130 teams participating every year. The event’s popularity is due to its affordable entrance fee and big rewards. This year’s tickets are $500 pesos and the grand prize is a brand new 4×4 truck. 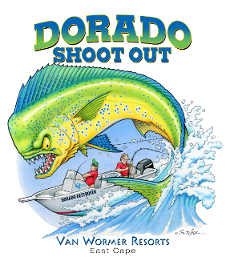 The goal is simple: catch the biggest dorado – all you need is a little luck! After the tournament, prizes will be awarded at Palmas de Cortés. To register your team, visit the official tournament website. 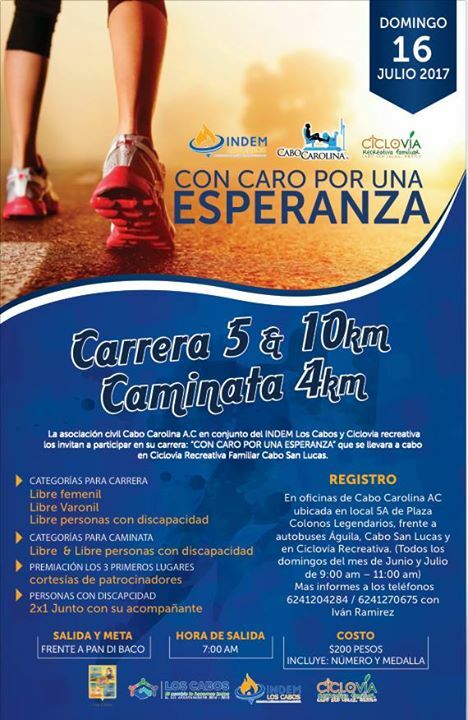 The Cabo Carolina Civil Association, along with the INDEM Los Cabos and Recreational Ciclovía are holding the Con Caro Race for Hope, “Fostering the social inclusion of people with disabilities”. The race has 5 and 10 kilometer sectors and a 4 kilometer walk, with Free Female and Male categories for differently-abled people and prizes for the first three places. The starting and ending point is in front of Pan Di Bacco, beginning at 7:00 a.m. Tickets are $200 pesos and include a number, t-shirt and medal. You can register at the Cabo Carolina office located at the Plaza Colonos Legendarios, space A5 on the ground floor. 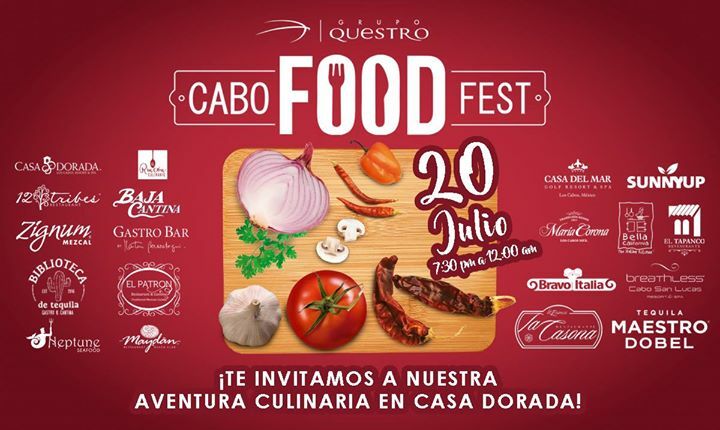 The first ever Cabo Food Fest is coming up soon, an amazing beachfront culinary experience featuring the best chefs and most delicious dishes of Baja California. The festival’s sole objective is to showcase Los Cabos’ culinary offerings. Enjoy a tasting at each food station, along with the best signature cocktails. This event takes place on July 20 from 7:30 p.m. to 12:00 a.m. Call (624) 163- 5764 or send an email to elrinconculinario@casadorada.com for information and tickets. 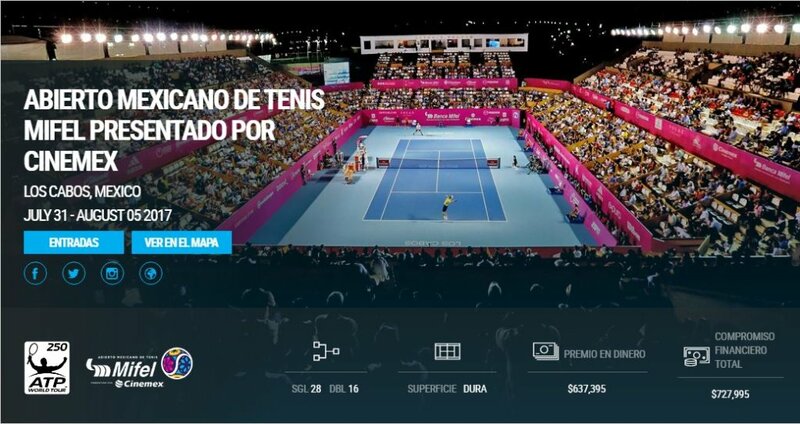 The week-long second edition of the Mexican Tennis Open is taking place at the Delmar International School, whose facilities exceed the necessities of an Association of Tennis Professionals tournament. The tournament will also be presented at Cinemex in Cabo del Mar within the Delmar International School. This private school opened in August 2015, has 2,800 m2 of construction and premium-level facilities to house the tournament and spectators throughout the week.